The Daring Dave & the Eye of Ra slot screams “Indiana Jones” from every fiber of its existence. Fans of slot games and of the highly praised movie series starring Harrison Ford will find great enjoyment in this game. Playtech has really gone the extra mile this time, starting from the intro itself. We see Jones—ahem – Dave escaping numerous traps as he quests for the Eye of Ra inside the Pharaoh’s tomb. The graphics and animation is of very high quality and the same applies to the episodic Bonus game. Music track is low quality and very uninspired, getting boring really fast. This doesn’t seem to be the case with the music during the Bonus rounds. As we already mentioned, there is no progressive Jackpot for the Daring Dave & the Eye of Ra slot. No matter, for getting 5 Dave Wilds in a row will win you a total of 5000 coins. What is interesting to note is the following. When you land the Dave symbol on any of the middle three reels, it expands over the whole reel. It then acts as a wild on each of those squares. 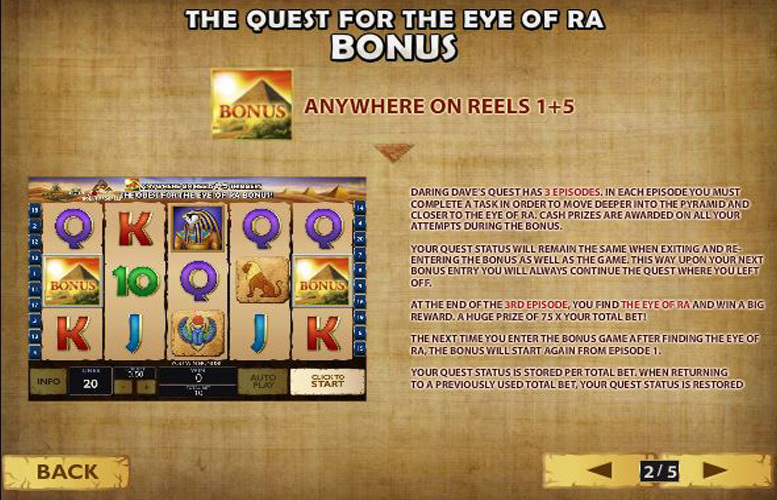 Level 1 – Pick three stones which have either a decent cash prize or an Eye of Ra. Get three of them, and advance to the next level. 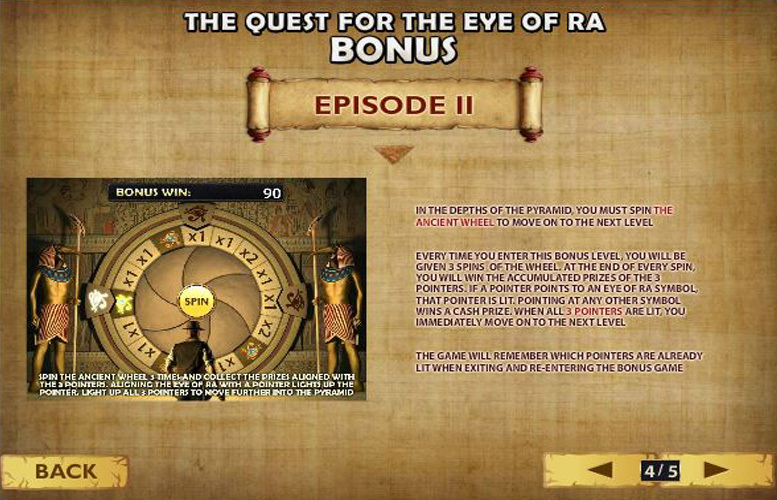 Level 2 – Spin the wheel three times to multiply your bet money or get an Eye of Ra. Again, land three of them and you progress to the final episode. 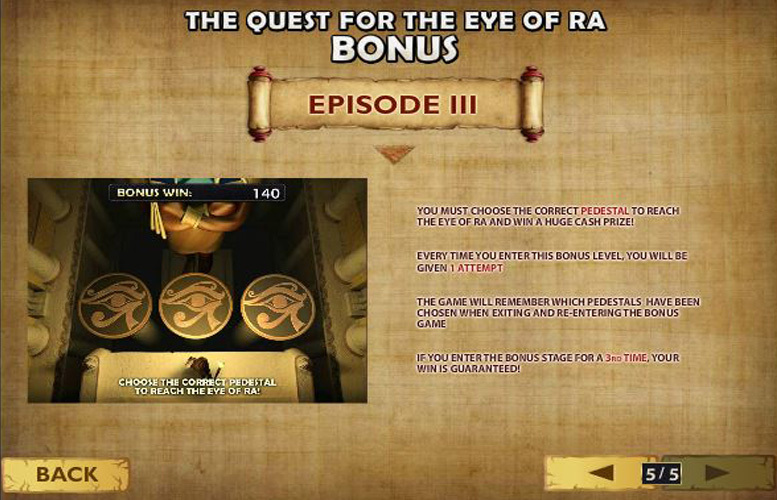 Level 3 – This time, you only get once chance to pick the correct symbol that reveals the hidden Eye of Ra and a huge cash bonus. If you don’t get it on your first try, don’t worry – your win is guaranteed after three tries. The progress is saved each time you exit the Pyramid (and the game itself). Even if you don’t unlock the next level or the Eye of Ra right away, you have the chance to continue the game where you left off. Every symbol you pick, every spin of the wheel, and each time you try for the Eye of Ra prize – it counts towards your progress. The little Pyramid in the top-left corner shows you what episode you are in. 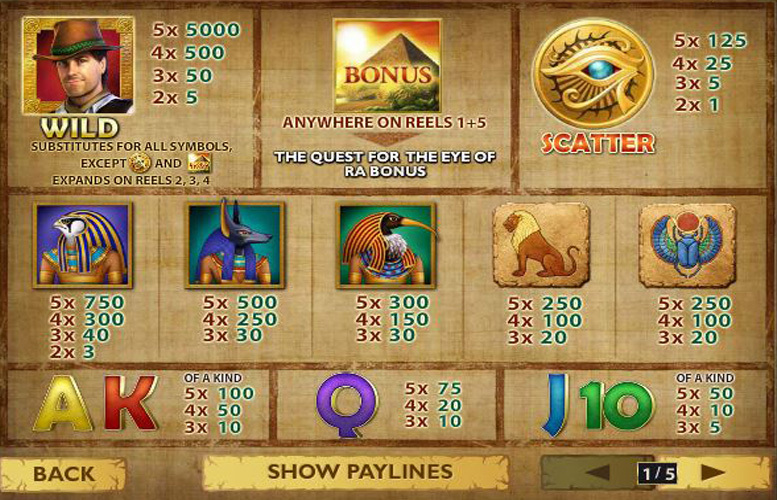 Symbols in the Daring Dave & the Eye of Ra slot are modeled after ancient Egyptian deities. We have the supreme Ra at first, which is the highest paying symbol (other than Dave), with a maximum of 750 coins in prizes. Then there is the god of Chaos, Seth – with a 500 coin max payout. Sitting by their side is the god of Knowledge, Thoth, with a meager 300 coin payout. The other two symbols you will encounter are the Lion and Scarab, which net you 250 coins max. Of course, we can’t have a Playtech slot without Poker card symbols. Prepare to see 10s through Aces which feel very out of place among the other themed symbols. Finally, there are the Wild Dave and the Pyramid Bonus symbols, which have been explained in the previous section. The Eye of Ra Scatter only pays a maximum of 125 coins, which is quite small when compared to even average-rate symbols like the Scarab. 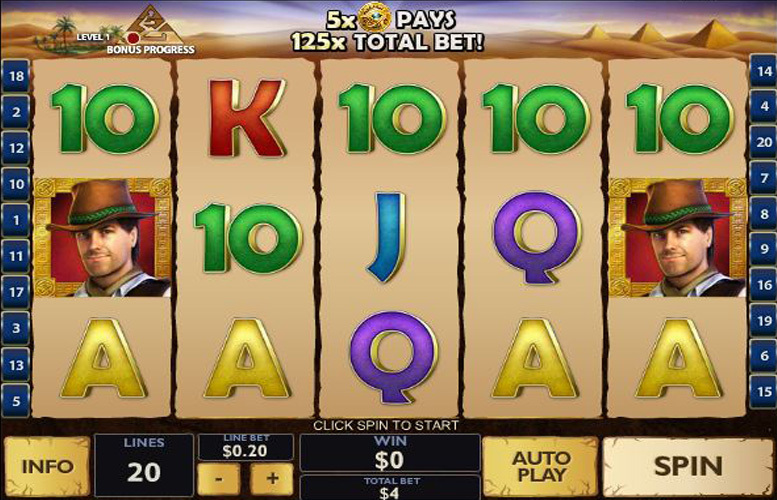 The Daring Dave & the Eye of Ra slot is a bit above the average in terms of coin values, which range from $0.01 and $50. With 20 possible paylines, the maximum bet you can place is of $1000. With the max standard Jackpot being 5000 coins, the ultimate prizes are quite high. Even more so if you consider the 25,000 coins you can win with the expanding Wild symbols. Playtech offers a fantastic experience with the Daring Dave & the Eye of Ra slot. The bonus games seem simple at first, but the highly detailed graphics, the narrator’s voice, and the sense of danger more than make up for that fact. Coupled with a chance for huge Jackpot and this game promises any daring adventurer the slot game they’ve always dreamed of. This game has a rating of 5 / 5 with 219 total reviews by the users.